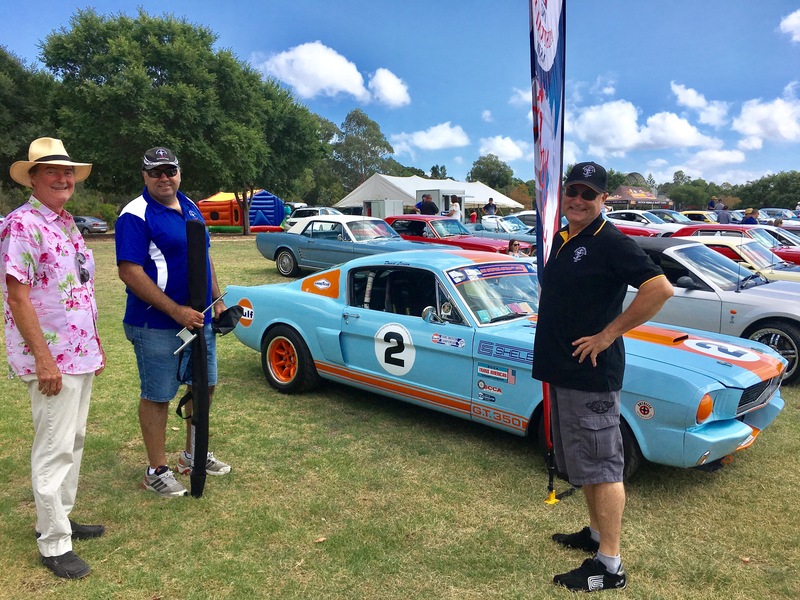 We’ve joined the Mustang Owners Club if Australia NSW (MOCA) and what a hoot it is. 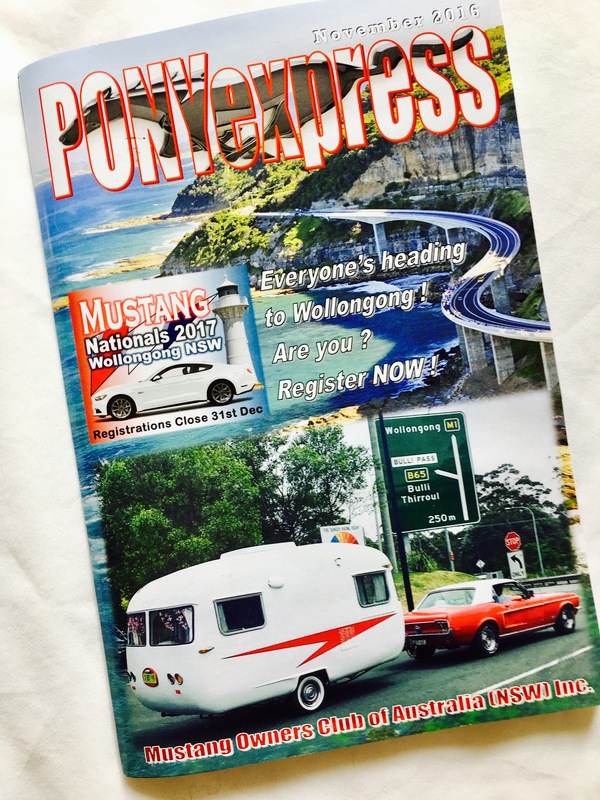 We made it to the cover of the Mustang Club magazine! We’re Mustang novices, and are in total awe of the other Mustangs in the club. The hours and $$$ that must have been spent to bring those 50 year old Mustangs into their peak condition is gobsmacking. They look newer than brand new and I’ve gained a new appreciation for chrome. Shiny as a Christmas bauble they make them. They chrome everything that isn’t auto painted – there’s not a whiff of plastic to be seen. We attended the MOCA Christmas event at holyroyd gardens, Merrylands on 11 December. We don’t usually go that far west without a compass – but it was worth it. Although talk about HOT! I couldn’t take refuge in Little Lucy feeling it was a little antisocial. They put on a lovely BBQ lunch – free for all members. 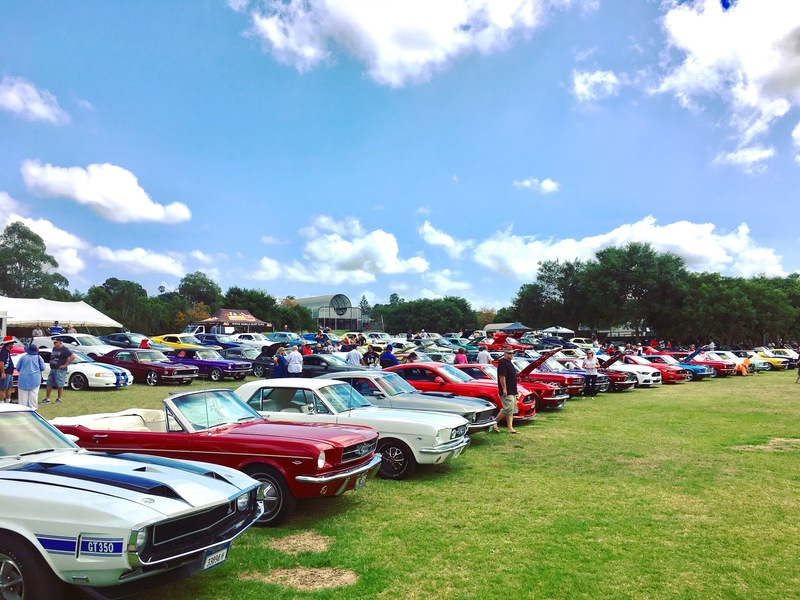 I reckon there were more than 200 Mustangs there. What is your Mustang type & year? How and where did you purchase your Mustang? We purchased privately finding it online at carsales.com.au. It’s had two owners since it was imported into Australia in 1988. 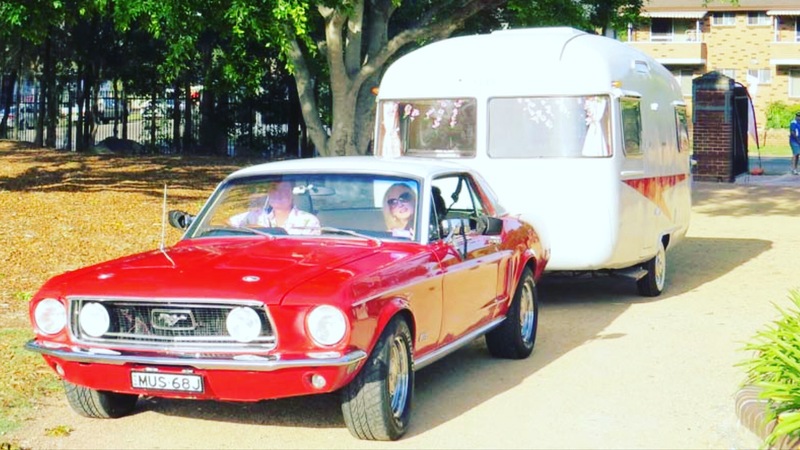 I had been looking for a tow car to match my 1962 Australian classic “Sunliner” caravan for almost two years. Justin was reluctant for me to buy a third car, and flatly refused to get an old Holden, which was my preference at the time. But when I showed Justin a red and white Mustang that would match our caravan, he finally relinquished. “How can I say no to a Mustang?” he said. The truth is we both fell headily, crazily in love with our red and white lady. A lot of men ask Justin, “How much did you pay for it?” But I’ve never heard a woman ask us that. To own a Mustang is not about price, it’s about love. I think women understand that when you love something, affordability is only the barrier to getting what you want. Bottom line though, the seller saw us coming – a pair of love-struck buyers – and we paid too much. But we will never regret buying her. How did you come to join MOCA? I think it’s important to find your tribe – a group of people who ‘get you’ and understand why you’ve fallen in love with a type of car. We knew our car would need some work, in particular a tow bar. So we went to Big Al’s to get her checked over and build a list of things that would need to be done over the next few years to keep her going and us safe. It was Big Al who told us about MOCA and encouraged us to sign up. What is your history of your interest in cars? Justin’s first car was a hi ace van that fitted his surfboard and Jane’s was a VW Golf fastback. We’re newbies when it comes to owning an classic car. A new journey has begun. Getting under her bonnet and seeing what makes her purr is a learning experience we’re thoroughly enjoying. Like us, she’s no spring chicken, but we’re sprucing her up as much as we can (afford). We feel privileged to have something timeless that connects us to the past, a time in the 1960s era that defined what it was to be cool. We’re members of a vintage caravan club and attend special meet-up events. It’s a delight to see how people have restored their vans. There’s all sorts – from the conservationist who do not change a thing, keep the icebox as it is and do not repaint. To those who completely renovate, install air conditioners and repaint it pink. We’re somewhere in between. We like to get away for short stays in the van. We have a ‘fur-baby’, a toy poodle called Boo-Boo, and we are excitedly expecting our first grandchild at the end of November. We both work full time – Justin working for himself as a commercial artist, sculptor and model maker and Jane doing public relations for a community care organisation on the Northern Beaches. 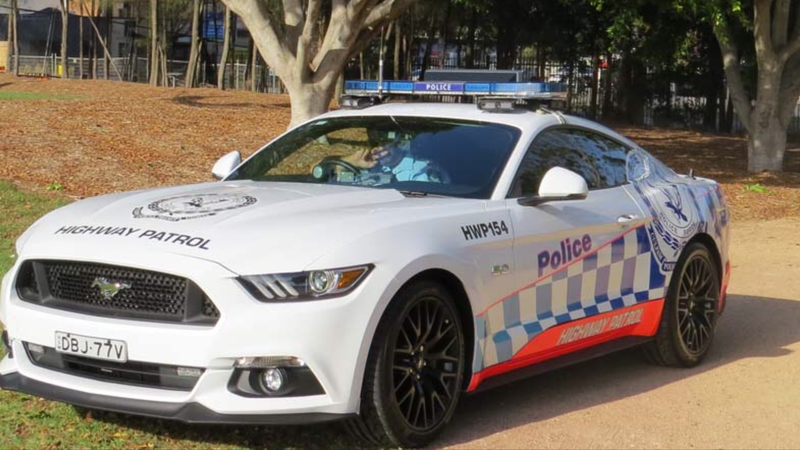 We were positioned in the novelty car section – next to Police Mustang car. But maybe we were the only one in the Rust Bucket Mustangs section? Justin talking to Club president and Vice President. We dressed in Christmas theme – but I don’t think they’re into it, preferring instead their Mustang Club uniform. Justin then purchased a Club shirt to fit in! 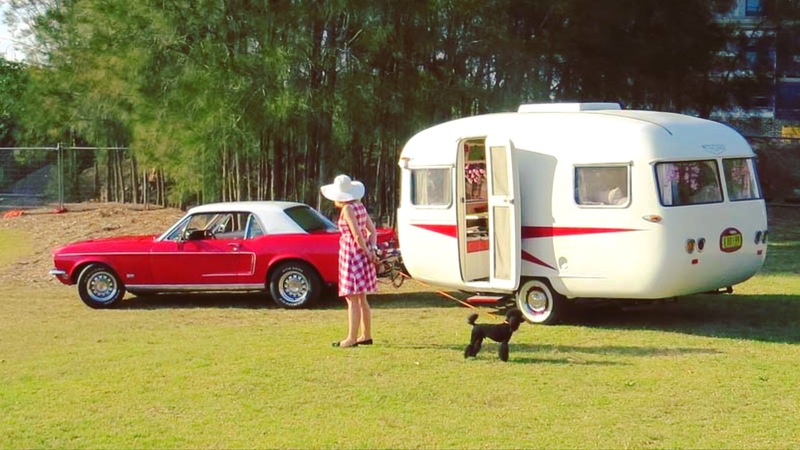 Here’s a wonderful snapshot of vintage caravans (or trailers as they call them in the US). Definitely eye candy for me. So many sizes, shapes, colours and designs have been created throughout the years. I like to take “home” with me when I travel – and I’m not the only one!